One of the most unique Lake George wedding venues is Camp Chingachgook. It’s a camp, yes. And there are a lot like it in the Adirondack Mountains. What all of them share is a certain polished-wildness. You’re there to enjoy the lake and the mountains. The outdoors. This camp which doubles as a wedding venue is right up against the lake. It offers stunning sunset views. Lakeside access and visibility. Mountains. Trees and a marina. In short a Chingachgook wedding is a great outdoor Adirondack wedding venue. This camp Chingackgook Lake George wedding photo was a quiet moment between Meghan and Dan, out on the docks of the Adirondack camp late in the day at their wedding. All of the guys were together. We were near a nice spot. So, I grabbed them and we made this great relaxed wedding group photo during a Top of the World wedding in Lake George NY. It’s a different kind of wedding group photo, and is exactly the kind of idea I like coming up with. Sure, we’ll always do some standard group and family photos at every wedding. That’s part of what I do. But I’ll never stop looking for the chance to make something different, something better for you. The personality comes out, the feeling of the day comes through. And you’ll end up with relaxed wedding photos that you’ll want to have on your wall, not just tucked away on a USB drive in a drawer. Couples wedding photo locations on Lake George. I enjoy taking the bride and groom away briefly from their wedding with the intent of making some great work as a Chingachgook wedding photographer. With the spectacular mountain scenery all I had to do was bring them to a beautiful spot and leave them alone, taking the first break away from everyone since their wedding ceremony at Camp Chingachgook. The late day light was stunning as always and the two of them just spent some time quietly together. I watched from a distance, allowing them to have a memorable moment alone as bride and groom, allowing me to make an intimate and quiet photo with a great graphic feel to it. When the light is great all by itself, I have the years of experience to see it and to finesse it. Many claim to be natural light wedding photographers. But with the ability to light my subjects when needed, I also have the ability to see the natural light at a wedding, and to use it to its best advantage. 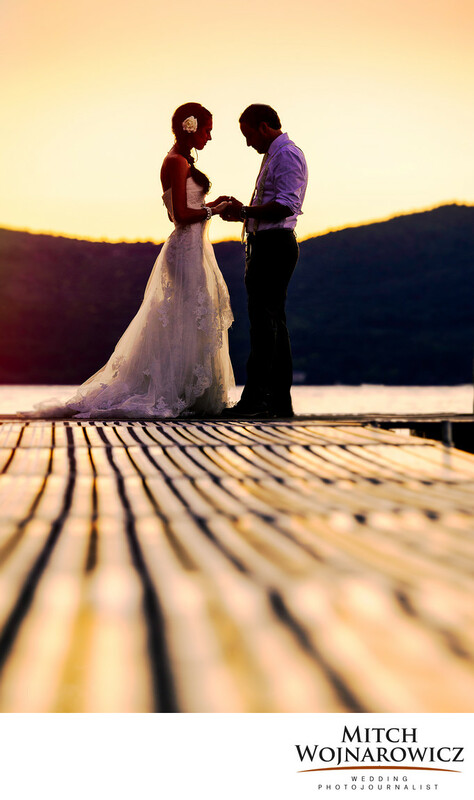 Hire a real Lake George wedding photojournalist, one who can produce the intimate wedding photos, the quiet wedding photos and the dramatic wedding photos you will love for years to come. I would love to show you more of my Lake George NY wedding photos. And weddings on Lake George NY are very popular, so my schedule gets booked over a year in advance. Don’t wait to get in touch with me, do it today. There won’t be lots of emails or sudden contacts on your social media feed. I’ve been doing this long enough to know to respect potential clients, treating them as partners and not a “prospect” to be hunted down. Keywords: adirondack (60), camp chingachgook (6), lake george (30).